The whole family crams into the gray 1951 Studebaker: Our family of five, Daddy, Mommy, Janice Jean and I (Mark isn’t born yet), Aunt Ruthie and Grandma–seven stuffed into an airplane cockpit, it feels like. We don’t take two cars because we are frugal. It saves gas if we all go together. Tonight is the first night of the Brunk Tent Revival. Two brothers, George, the evangelist, and Lawrence, the song-leader, have brought a huge, unstriped tent all the way from Virginia in a tractor-trailer truck. As we approach the tent, I think we’re going to a circus except that there are pine plank benches crunched down on sawdust and spiral-bound, red, white, and powder blue songbooks on the seats. The crowd, of course, doesn’t look like circus-goers. They are polite, plain people, some pious-acting, but others even laughing. I notice the pig-tailed girls I play with when we have a “bunch” over for Sunday dinner: there are the Garber sisters, the Oberholtzers, the Brubakers, and Kraybills. We exchange shy smiles and find seats by families. Tonight at the revival service we also sing a cappella, keeping pace with the song-leader’s energetic gestures. Then Brother Brunk comes to the lectern, a hefty Bible in one hand. He starts off with a joke or silly comment, which my Grandpa Metzler criticizes with the comment, “He even makes the people laugh!” He then preaches about our guilt because of sin and God’s loving plan to save us through his Son Jesus. His words pierce my consciousness, and a sense of need fills my heart. I can visualize Jesus standing before me with outstretched arms. The invitation for people to come forward sounds like an appeal directed only to me. I begin to cry softly, tears falling onto the lap of my lavender and white dotted Swiss dress, hoping someone will pay attention and tell me what to do next. I cry louder and notice my parents discussing what to do with Marian. Daddy walks with me down the aisle and ushers me into a “prayer room,” a miniature tent off to the side. There I meet kind Anna Ruth Breneman who shows me more Bible verses and prays short phrases that I repeat, asking Jesus to come into my heart, take away all my sin and fill me with new life. I feel cleansed, happy, relieved. There is another step in the process. Next, I am led to a platform where I as a nine-year-old make my first public speech, a testimony of four simple words: “I’m glad I’m saved.” Aunt Ruthie meets me after the benediction and gives me a kiss on the cheek, which takes me by surprise. She has never before shown much affection. Apparently she approves of my decision. On the way home, I sit on the back seat next to the window and look up at the clear, starry sky and full harvest moon. I feel euphoric. 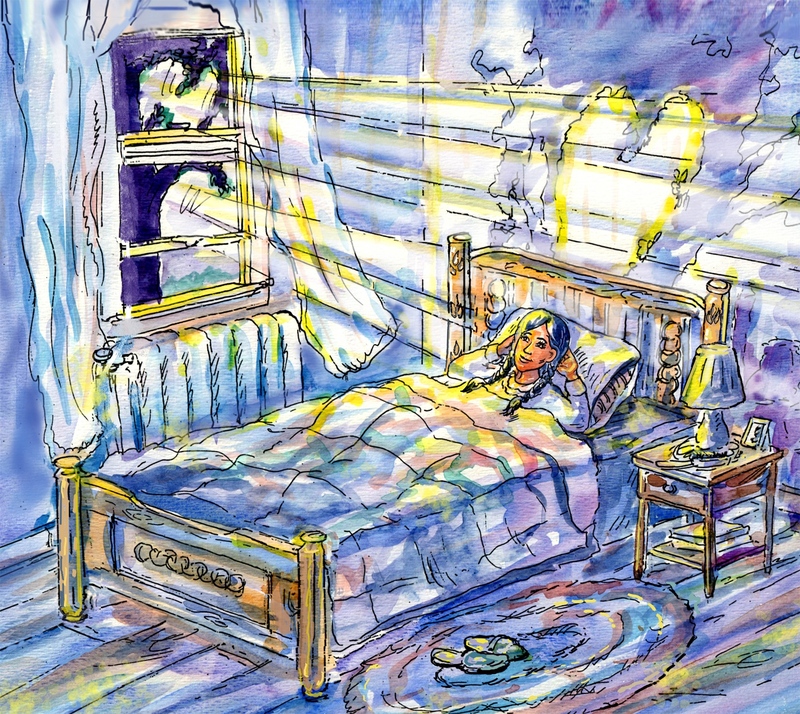 Later on, I go to bed and see that same moon casting a shaft of pure radiance in through the window-panes, bathing the oak headboard with mellow light. It traces the interlocking circular patterns punctuated by an upright sprig of laurel on each bedpost. Silent night, holy night, all is calm, all is bright with the shaft of light that has penetrated the panes of glass magnifying the joy in my heart. Years later, I learn that the proper word for this moment is epiphany, a manifestation of divinity in the life of a simple, trusting, Mennonite girl. I can’t tell you how much resonance I feel with this and the similar memories it evokes, from the “Dropping, dropping, dropping, drop-ping, hear the pennies fall, every one for Jesus, He will take them all.” (We sang ‘he will get them all’). The Brunk Brother revivals … (I have a marvelous picture of a crowd in the tent at a revival in Indiana with my grandfather and grandmother sitting right down near the front of the sawdust trail–I gotta use that sometime on my blog!) And yes, I too went forward after a George Brunk sermon and I have to say it was a meaningful experience even though people question those sometimes. Thanks for sharing and inspiring. LOVE your testimony, i.e., your story of how Jesus became LORD. This is what we need to know about all of our friends and acquaintances. Thank you for sharing! I’d like to hear your story sometime. Maybe when the hurly burly dies down a little. Anyway, looking forward to it! What a beautiful picture of God’s amazing grace. To think, we would never have been friends if God had not intersected our lives with His love. How wonderful, how marvelous. Someday I want to hear your story. Come to think of it, you may have told me and I have forgotten already. I hope the Monterey air will clear out the cobwebs in my brain. Praying for you this week with family in MD. Not only have you shared an amazing depiction of this precious moment in words, you have shared your rendering of the emotions following. I remember this high moment in my life as well, and the joy of going to the tent revivals held by my grandmother’s church. Marian, you are one of God’s most precious gifts in my life — I’m so glad we’ve become friends in this cybercommunity. I treasure your friendship, too. Sherrey. One day we’ll probably meet person to person. Thank you for all of your encouragement to me, a newbie in my encore career as a writer. You and others in this cybercommunnity have been a wonderful example and mentor. Thank you! Oh! What a tribute to the memories of youth and the Lord. I still have those from my childhood in the Deep South with the words, “Just as I Am” with every invitation to join the congregation at the end of each sermon. 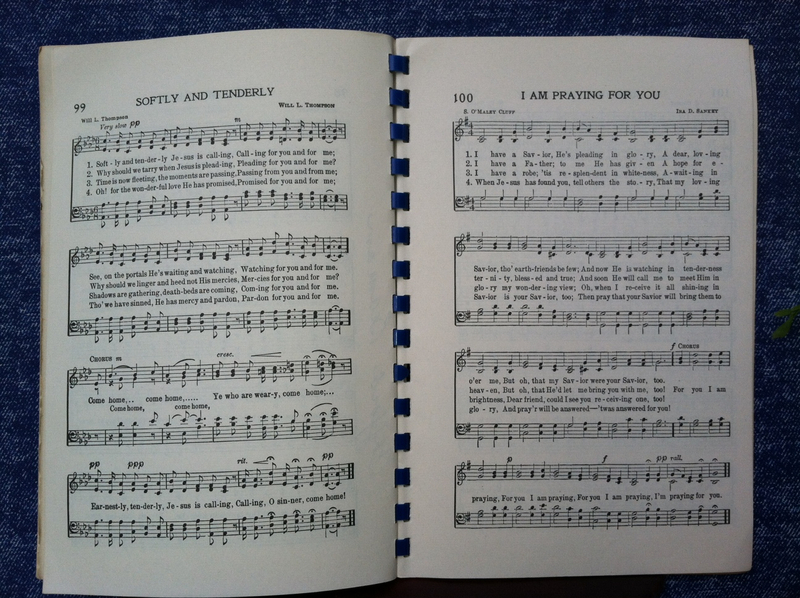 I love the old hymns and sometimes, with a thought, one will get stuck in my head for days. “Love Lifted Me” pops into my head to this day whenever I am perturbed by somebody else’s behavior. Those revival tents are where I met some of my most loyal and trusted friend. This post struck a chord. I’m glad it brought back musical memories to you as well. And thanks for your constant encouragement. I believe our life experiences, like this one, coincide in other interesting ways too, Traci. Marian, this is beautiful. I love that the epiphany happened in your bed after the service was over and all the excitement had died down. Your artist husband did an extraordinary job with the illustration. The tone is perfect. Yes, the afterglow was as memorable as the initial experience. Cliff appreciates your comments about the illustrations. His studies of the originals you see were done years ago: to encourage my writing + to express himself artistically as well. He has given them a tune-up lately. We’re glad you enjoy them.